Police in the eastern Indian state of Orissa shot and killed at least three people on Thursday in continuing communal violence, officials say. Police opened fire on a large crowd of Hindus after a village police station was set on fire. The crowd had been complaining about a lack of protection after Christians set fire to several Hindu homes. Christians had retaliated after 19 churches were destroyed in violence that began on Christmas Eve. The disorder in the remote tribal area has continued despite a curfew and the deployment of a large number of state and federal police. The state government has ordered a judicial inquiry into the violence, which has disrupted telephone lines and other communications. An additional 200-strong paramilitary force is being deployed to the area after Orissa's chief minister, Naveen Patnaik, called for more federal help to quell the violence. 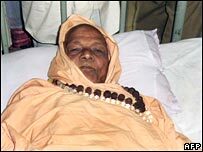 Members of the hardline Vishwa Hindu Parishad (VHP) said Christians sparked the violence by attacking one of their leaders, Swami Laxamananda Saraswati, on Monday. Hindu groups also accuse Christian missionaries of forcing tribal people and low-caste Hindus to convert to Christianity. But Christians deny the claims and accuse the Hindus of objecting to them celebrating Christmas. The BBC's Tinku Ray in Delhi says the issue of conversions is very sensitive in India, where several states have laws that forbid or make it difficult to convert. Orissa has seen some of the worst attacks on the minority Christian community.